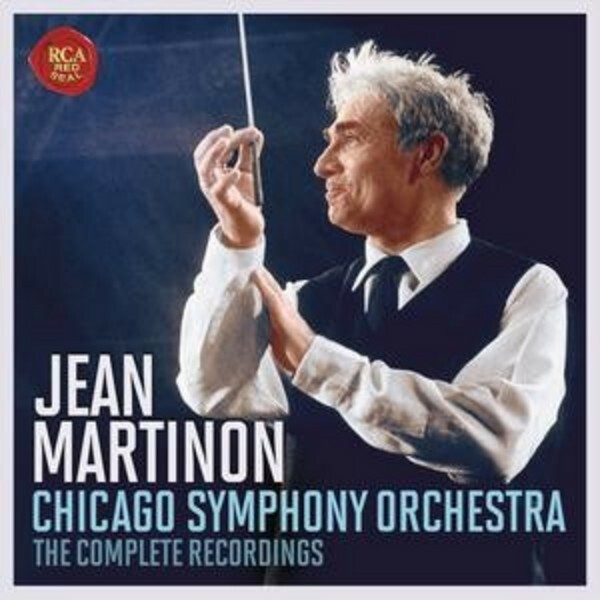 The renowned French conductor Jean Martinon (1910–1976) studied with Charles Munch and Albert Roussel and was also a distinguished composer. His performances, in the words of one of his biographers, “were distinguished by a concern for translucent orchestral textures, and sustained by a subtle sense of rhythm and phrasing”. In 1963 he was appointed to succeed the legendary Fritz Reiner at the helm of the Chicago Symphony Orchestra. As one critic recently put it: “Reiner was a tough act to follow, and Martinon’s preferences for contemporary music couldn’t have been more different. Yet there’s no question that he maintained the orchestra’s exalted performance standards (improving them, in my opinion)”. During Martinon’s five-year tenure in Chicago he made nine critically lauded recordings for RCA Victor. Now for the first time ever, they are being issued together in a single Sony Classical box set of 10 partly re-mastered CDs. The repertoire includes suites from Martinon’s teacher, Roussel’s Bacchus et Ariane and Bizet’s L’Arlésienne, Bizet’s Symphony, his own Fourth Symphony (Altitudes) – commissioned to mark the CSO’s 75th anniversary – and the Seventh Symphony of American composer Peter Mennin, as well as reference recordings of Ravel’s Rapsodie espagnole, Alborada del gracioso, Ma Mere l’oye and Daphnis et Chloé Suites and Introduction and Allegro. Reviewing a reissue, BBC Music Magazine praised these “wonderfully detailed, expansive and vital performances”, observing that Martinon’s “characteristic combination of precision, intensity, breadth and rhythmic alert-ness particularly suits Ravel’s wide-spanning forms and sensual sound-palette”. Yet Martinon’s tastes were wide-ranging, as even these relatively few Chicago albums amply demonstrate. For example, he recorded the two Weber Clarinet Concertos with soloist Benny Goodman, a coupling (Grand Prix du Disque, 1967) of Frank Martin’s Concerto for 7 Wind Instruments and Varèse’s Arcana (“… the galvanic intensity of a live performance plus a degree of visionary poetry that subsequent accounts have lacked" – Chicago Tribune), Hindemith’s Nobilissima Visione, Bartók’s Miraculous Mandarin Suite and a reading of Nielsen’s Fourth Symphony still regarded by many critics as a benchmark. The orchestra’s audiences and some of its musicians, reared on an Austro-German musical diet, were unfortunately perplexed by Martinon’s innovative programming, though his resignation in 1968 to return to Europe was probably triggered by a personal vendetta against him by Chicago’s powerful leading music critic. We are fortunate to have this collection to remember his unassailable achievements with the CSO, which also includes a bonus of previously unpublished recordings from the archives and Robert Casadesus playing his own Piano Concerto, with Martinon conducting the French National Radio Orchestra in 1969. Every recording in this new set comes from the best source, some newly remastered from the original tapes. The discs are presented in facsimiles of the original LP artwork. An enclosed booklet offers vintage photographs, complete discographical information, plus a new essay.